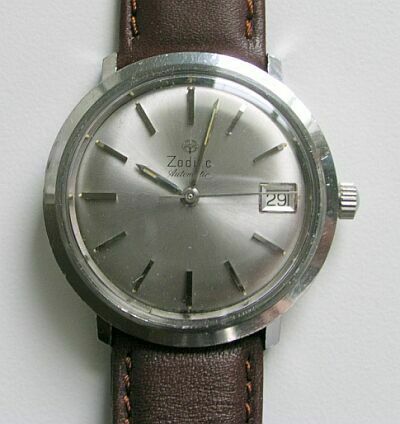 ZODIAC Swiss Automatic 17 Jewels, Date, "Hack Watch" with a mechanism to stop the balance when the setting crown is pulled out (calibre 70-72). Signed on the movement and on the dial. A three piece stainless steel case with a new stem and crown, crystal and leather strap. The grey-silver dial is in perfect condition. Raised applied silver colored hour markers and hands with a sweep second hand. 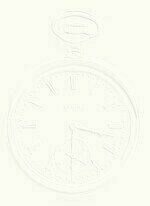 Watch is approximately 34mm (1 5/16") without the crown. The pictures don't do this watch justice. The camera is reflected in the pictures. A mint condition calendar watch that has been tested by wearing it for a week to see if it runs overnight without manually winding it.This watch has been cleaned in a watch parts cleaning machine and then when reassembling it was adjusted and oiled. It has a lifetime mainspring, the movement is an automatic-wind model that winds from the motion of your wrist. The watch was manufactured to out-wear the wearer(s) if it is properly cared for. Add $75-$85 to the price of a Zodiac you buy at auction on ebay when it says - "it could use a good cleaning" and you can realize the value of this restored 1970's watch.